The following meal suggestion for a St. Valentine's Day dinner was submitted by Eliana Murphy. Thank you Eliana! 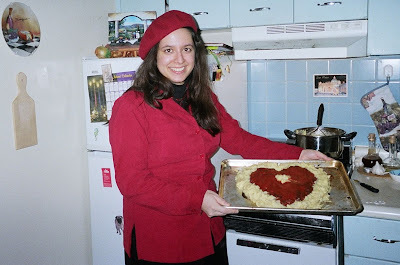 I found this recipe for a heart-shaped meatloaf back in the mid-90's and thought it would make a charming St. Valentine's Day meal. Together with the salad and some steamed veggies, it could form a wonderful part of St. Valentine's feast! 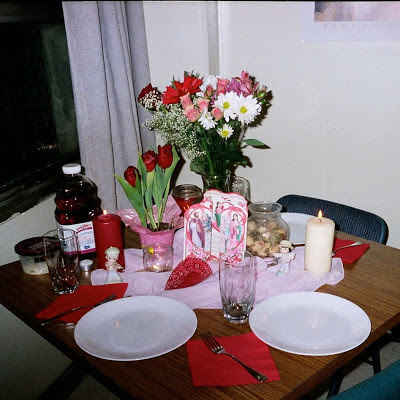 The pictures are from when I prepared it six years ago for some friends at my grad school apartment. In keeping with the heart theme, I would suggest making a strawberry spinach salad with fresh baby spinach leaves and sliced strawberries. Other topping suggestions include gorgonzola, brie, almonds, carmelized pecans or red onion. My family normally just buys a berry dressing at the store, but if you feel like making your own, many cooking sites such as this one offer homemade dressing recipes for strawberry-spinach salad. This meatloaf has a nice Italian flavor to it and is an easy dinner for St. Valentines Day that the kids can help to make! Just make sure those little helpers wash their hands well before and after mixing the meatloaf... The recipe is adapted from Mom's Magic Meatloaf from the Sunset Magazine Low Cholesterol Cookbook. In a large bowl, combine bread crumbs, cheese, basil, pepper, egg whites, garlic, and 1 cup of the tomato sauce. Add beef and mix lightly. 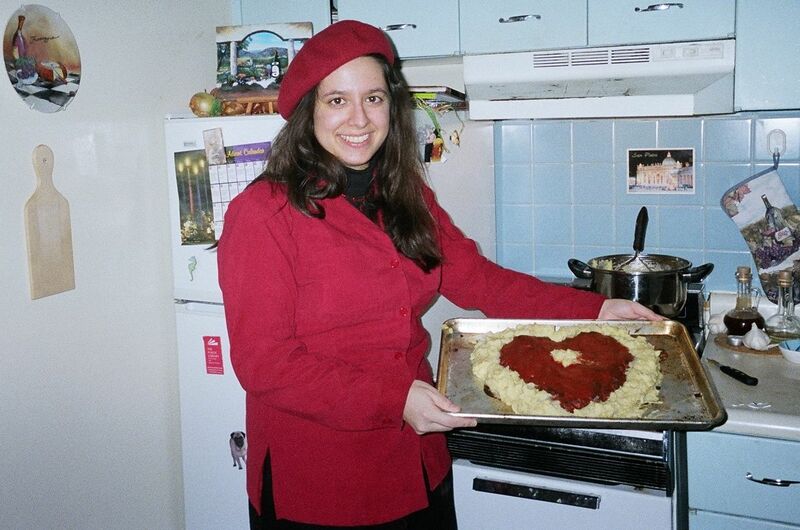 In a rimmed shallow baking pan (about 10 inches in diameter), shape mixture into a 2-inch-thick heart. Bake in a 400 degree oven for 45 minutes. Remove from oven; carefully drain fat from pan, then top loaf with remaining tomato sauce. Bake for 15 more minutes. While meatloaf is baking, place potatoes in a 3 to 4-quart pan and add water to cover. Bring to a boil over high heat; then reduce heat, cover, and boil gently until potatoes are tender when pierced (about 20 minutes). Drain and peel. Mash with a potato masher or electric mixer until smooth; slowly beat in milk. Season to taste with salt and pepper. Transfer meat loaf to serving plate. With a pastry bag fitted with a large star tip, pipe potatoes around meat loaf. (Or simply spoon potatoes around loaf.) Makes 8 servings. This meatloaf goes well with steamed vegetables, such as broccoli, cauliflower, California blend, frozen artichoke hearts(! ), etc. A nice dessert for this meal would be heart-shaped Linzer cookies! I made these a couple of years ago but unfortunately cannot find any pictures from that time to share. Dear Lord, who art high in the Heavens, giver of Love and Passion, and He who strings the heart’s cords, lead the Lovers this day, February ten plus four. The day during the month of two, when the date is the perfect number of God greater two souls and two hearts. Some Loves are fleeting, but that which is built on you will never fail. So guide the Lovers to know what is to be. Your truths the Lovers’ mouths should speak, for Your truth is that which is honest to the heart. Only this, then, should pass over the red lips of the Lovers. Your art, the Lovers simply a medium. It is only with True Hearts that You can create a Masterpiece, So let the Lovers remember that their Soul’s Desire is the one for which You light their Fire. And let it be You who creates the Art of the Lovers; The art of two into one. Amen.